Lladro Porcelain Figurine, The Happiest Day. 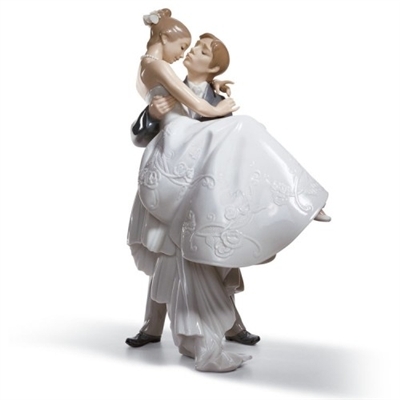 Size: 10.75" x 6.75"
This groom has swept his bride off her feet as he carries her on their wedding day. Minute detail in the bride’s pearl necklace and earrings and the decoration of her dress, imitating embroidery. One of the supports for the piece is the train of the bride’s dress.